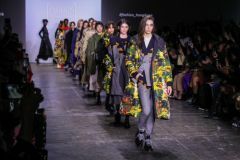 HONG KONG, Feb 14, 2019 - (ACN Newswire) - The Hong Kong Trade Development Council (HKTDC) took three Hong Kong fashion labels to launch their Fall/Winter 2019 collections at New York Fashion Week on 8 Feb. 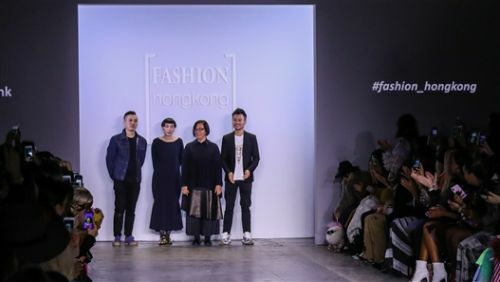 The Fashion Hong Kong runway show was attended by a packed audience, attracting more than 500 buyers, media representatives and fashion experts. The event was also streamed live, allowing fashionistas around the world to catch the show online. The three Hong Kong labels featured at this year's Fashion Hong Kong runway show were ANVEGLOSA, established by Annette Chan; HEAVEN PLEASE+, formed by the design duo of Yi Chan & Lary Cheung; and Mountain Yam's label 112 mountainyam. Scores of fashionistas and celebrities attended the event, including Hong Kong fashion celebrity Daisy Toi, actresses Francesca Curran and Nicole Kang, and Miss America 2019 Nia Franklin. Media representatives from respected publications including Daily Front Row, Elle, FashionWeekOnline.com, Marie Claire, Women's Wear Daily (WWD) and Xinhua News attended and reported on the show. Following the Fashion Hong Kong runway show, the HKTDC organised a networking reception at the Arlo Roof Top (A.R.T.) of the Arlo SoHo hotel on the same day, connecting Hong Kong designers with fashion industry representatives. More than 100 buyers, industry players and media reporters were treated to a fashion presentation at the event, with Loren Nadres, Director of Economic Development, New York City Mayor's Office, coming along to show the city's support. Fashion Hong Kong is a series of international promotional events organised by the Hong Kong Trade Development Council (HKTDC) to promote Hong Kong fashion designers and labels in the global fashion arena. Since 2015, Fashion Hong Kong has actively participated in international fashion weeks and renowned events - in cities such as New York, London, Copenhagen, Tokyo and Shanghai - to showcase Hong Kong's unique and diversified designs. To further promote the city's fashion brands and foster exchange and collaboration between Hong Kong designers and international buyers, the HKTDC is running the Fashion Hong Kong Showroom from 1 Feb to 31 March at FTL Moda, one of the major professional showrooms located on New York's Seventh Avenue, also known as the "Fashion Avenue". In addition to the three designer labels showcased at the runway show, 10 other budding Hong Kong fashion brands - BIG HORN and Ejj Jewellery (both returning for another year), ANDREW KAYLA, ARTINI, Berayah, Blank Concept, FAVEbyKennyLi, Jade in Style, Jewcells, and NoBeing - are being featured in the Fashion Hong Kong Showroom. Continuing the momentum of New York Fashion Week, different brands are seizing the opportunity to showcase their new collections. To maximise exposure for the Hong Kong fashion brands during their time in New York, Fashion Hong Kong will take part in COTERIE - the premier global event and trade platform for contemporary fashion brands in New York - for the first time. Participating brands, including ANVEGLOSA, HOUSE OF V, Methodology and more, will showcase their collections in COTERIE from 25-27 Feb to help them connect with international buyers. Fashion Hong Kong, for the first time, is collaborating with international fashion trade journal Women's Wear Daily (WWD) to produce a "Hong Kong Style Guide". The guidebook introduces Hong Kong fashion brands that have showcased their collections during New York Fashion Week, including ANVEGLOSA, HARRISON WONG, HEAVEN PLEASE+, Hidy N.G. and Loom Loop. The guidebook was distributed during New York Fashion Week to promote Hong Kong's advantages as an innovation hub and centre for fashion design. The event has received support from DHL Express, Evian, Antalis Paper and AVEDA. Annette presented her label for the second year in a row at New York Fashion Week. The collection is inspired by the "good old days" of fashion design and is also a symbol of our respect towards the tradition and heritage of the fashion industry. It features three main colours: black and white to represent the nostalgia of old photos, and an accent of green to invigorate the collection. Hitting the runway at New York Fashion Week for the second time, Yi & Lary Cheung brought their new collection to the stage. Mountain made his debut at New York Fashion Week with his new collection, Hide & Seek. Wild animals hide in the forest, avoid being hunted and also seek chances to hunt. When faced with a threat, wild animals believe they will survive only by fleeing. In human society, people tend to hide in their comfort zone; when facing problems, most people run away or find excuses. It's time to get the issues solved and move forward! The Fashion Hong Kong runway show, held on 8 Feb, was packed with industry representatives. Among those attending the Fashion Hong Kong runway show were Hong Kong fashion celebrity Daisy Toi (picture) and actress Nicole Kang.